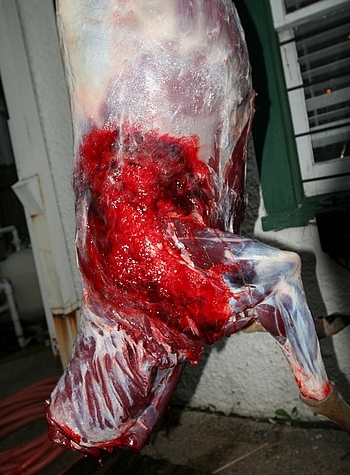 Below is a picture of a 200 pound whitetail, shot by my friend, using your .224 cal. 40 gr HV at 50 yards with a .223 Remington that I hand loaded for him. We knew it was going to be a close shot and we were curious about testing this bullet's performance. I witnessed the shot and the buck dropped DEAD IN HIS TRACKS. My friend is a pathologist and I am an orthopaedic surgeon in training, so we were both anxious to cut into him to see the results! He hit him higher than I would have liked from an elevated position with the buck’s left side facing us. Pictures are below. I thought the bloodshot tissues were very interesting. What appeared to be a tremendous amount of bruising on the subcutaneous surface, actually turned out to be more similar to what we classify medically as subcutaneous emphysema, as seen from leaking lung tissue following lung surgery or punctured lungs due to injury. It is caused by escaped air bubbles that trap themselves under the skin that “crackle & pop” when palpated, a sound we call crepitus. In some respects, I expected this from a high lung shot such as this. 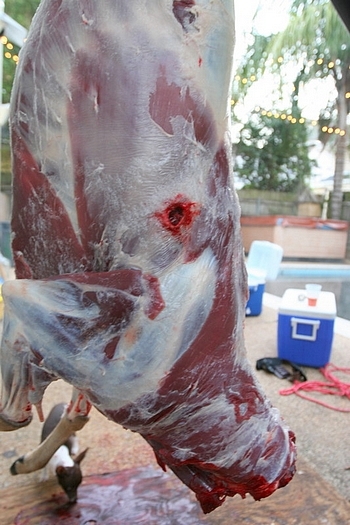 Albeit, the damaged deer tissue did have a much larger blood component than standard subcutaneous emphysema found in a non-traumatic low energy wound. Furthermore, the bloody component had lower viscosity than normal whole blood, which is representative of plasma and interstitial fluid with lysed (burst) red blood cells. This seems to indicate that the bruising was caused by high energy forces rather than a post-mortem leakage of whole blood from the thorax into the subcutaneous space. In other words, the bruising was caused at the time of impact, which of course is what we would expect anyway. After all, dead animals don’t really bruise, right? It also seemed apparent that there was a large initial release of energy from the small 40 grain bullet just below the surface of the skin. Furthermore, it was even more interesting that this bruised subcutaneous tissues was easily wiped away from the surface of the muscle tissue using the blade of the knife at a perpendicular 90 degree angle to the carcass. After wiping away the emphysematous tissue and fat, there was surprisingly little to no damage to the muscle tissue beneath, outside of a fist sized area! The rest of the wound channel was anticlimactic and simply represented a narrow wound channel approximately ¾” in diameter throughout the cavity and exiting the far side of the skin. The skin had a similar ¾” diameter exit with no bruising. No bullet was recovered.